Well Behaved Women: I’ve been jumping back and forth between the first draft of book two — which is at 6,000 pages or so now — and a second draft of book one. I’m also in the early planning stages for the covers, and I have what I think is a really cool concept in mind. Action Figures – Issue Seven: The Black End War: Fourth draft finished, and it’s off to my editor! She should have her work finished by the end of the year. On a completely frivolous note, I finally indulged in a new banner for shows. 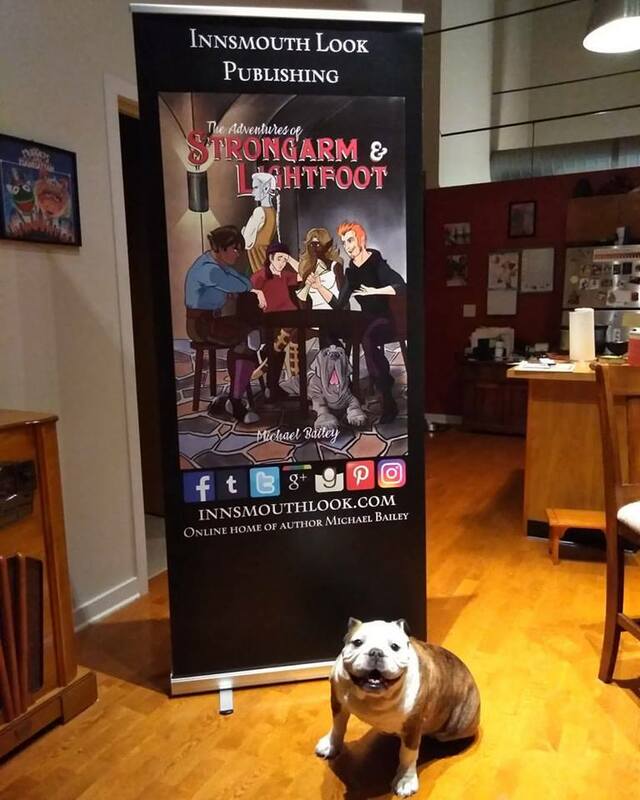 I used the artwork from The Adventures of Strongarm & Lightfoot – Blades of Glory and spent a little extra to get a more portable style of banner to make transportation and setup easier. As you can see, my dog Beatrix likes it. So do I!